Today I’m thrilled to have a brilliant guest post from the lovely Holly Seddon. Holly is the author of Try Not To Breathe, which I read and loved!!! Holly Seddon is a freelance journalist and editor. As a mother of four, Holly divides her time between writing, walking her miniature schnauzer and chasing homework-evaders around the room. And then doing some more writing when night falls. TRY NOT TO BREATHE is her first novel, published to great acclaim in the UK, US, Netherlands, Germany, Russia, Poland and Taiwan. Holly is currently writing her second novel. You can ask her about it @HollySeddon. Try Not to Breathe originally began over a roasting tin bubbling with hot oil and scented with rosemary and garlic. I was only half-listening to a health programme about persistent vegetative states on Radio 4 while I cooked Sunday dinner, and I was just tipping the par-boiled spuds into the big tray when I heard a phrase that stopped me in my tracks. “It’s like a kind of living death,” someone said. As much as my heart broke for the patients and their loved ones, that moment was the start of a journey that took six years. From shaking the roasting tray to getting to know my character Amy, a girl cut down in her prime, to seeing my book in shops. It was a rough six years, in many ways. Their were some deep losses along the way that saw the work in progress put to one side because other people needed me more than my characters did, but I always went back to it. Eventually, I was ready to submit to agents. The book was in perfect shape and needed no work whatsoever. (I’m joking, obviously). But I felt proud of it. It had a proper story, characters I loved and an interesting premise. I didn’t exactly feel confident – does any newbie writer – but I felt like it was time to go for it. I made a shortlist of agents whose work – and whose clients’ work – I admired. This sounds like a lie but I promise it’s the truth, top of that list was Nicola Barr. She’d worked with Colette McBeth on her debut Precious Thing, which I’d recently read. I’d also read about Colette’s own journey to publication and how Nicola had worked with her to hone the manuscript. This is what I really needed. I sent my synopsis and three sample chapters and made a cup of tea. Signing with my agent the real beginning of the publication process. The second half of the book needed some work – I’d tried to write what I thought I had to, for the genre, and not what I wanted to – and Nicola helped me immensely and gave me confidence in my own intuition. It’s been a lot quicker the second time around – but that’s a story for another day. In October 2014 Try Not to Breathe was sold to Atlantic/Corvus in the UK, where an incredibly passionate team have done a wonderful job of getting it out there, in the best possible shape. It’s since sold to publishers across the world. The last two years have been incredible. Better than I ever could have dreamt when I first said, as a precocious toddler, that I wanted to write books. I flew to New York to meet my US editor last November, and I’ve held copies of my book published in Turkish and German, I’ve been a bestseller (I still feel like a show off saying this) in several countries. But nothing will compare to the moment my mum sent a picture to me of my proud dad holding my book in Waterstones near my home town in Devon. For me, that was the absolute peak. The happy ending to a story that started with some ordinary roast potatoes and changed my life along the way. 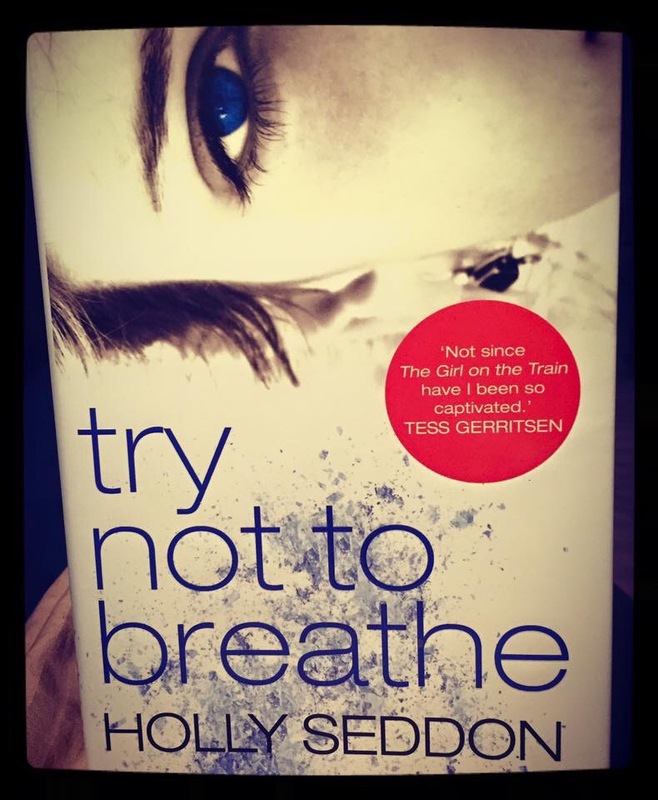 My thanks to Corvus and Holly Seddon for my ARC of Try Not To Breathe. I’d seen this book and lots of reviews popping up on my Twitter feed so I was thrilled to get a review copy. I tried not to read the reviews so that I didn’t know much of the plot, as it makes it easier for me to make up my mind about the book. Try Not To Breathe, for me, started slowly. Which isn’t necessarily a bad thing, but I’m used to books opening with gruesome murders or crimes. The change of pace was welcome though. It pulls you in and makes you wonder how Amy ended up where she did, and what happened to Alex to make her the way she is. Lately, it seems like all the books I’m reading involve children in horrendous situations, death, abuse, kidnapping and so on. However, books like Try Not To Breathe take you on a journey. They make you feel for the characters, and their circumstances. It is effortlessly written, blending Amy’s past,with Alex’s present and weaves the perfect take around the true events of Amy’s attack and subsequent hospitalisation. I gave Try Not To Breathe 4 ⭐️ on Goodreads. The only reason I dropped a star was that I figured out early on who had put Amy in the hospital. It was still a great book regardless of knowing early!